American-style pancakes are usually made with buttermilk, but low-fat Greek-style yogurt does the job perfectly and you can serve any leftovers with the pancakes. 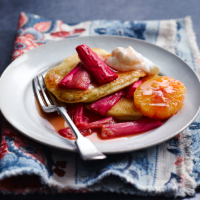 These go brilliantly with a spoonful of rhubarb compote. 1 Preheat the oven to 140°C, gas mark 1. Put the dry ingredients and a pinch of salt into a large bowl and whisk to combine. Pour in the yogurt, milk and vanilla, then crack in the egg and whisk to make a smooth, thick batter. 2 Set a large frying pan over a medium heat, then add a splash of clarified butter or oil. Drop in 2 heaped spoonfuls of batter, nudging it into round shapes if you need to, allowing plenty of room for the pancakes to grow. It’s important not to let the pan get too hot. 3 After 1-2 minutes, when the odd bubble appears, flip each pancake using a spatula and cook for 1 minute more, until well-risen. Keep warm in the oven while you cook the rest of the batter, using a little more butter or oil each time. Serve, with rhubarb compote and a spoonful more yogurt, if liked.